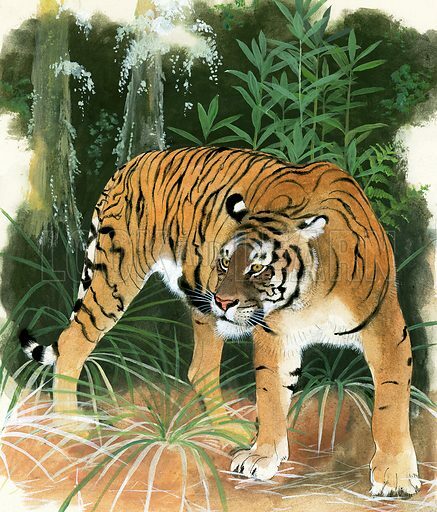 The now extinct Bali Tiger (Panthera tigris balica) was the smallest of all tiger subspecies. The last was shot in 1937. All tigers are now at risk, but the subspecies at each end of the size range are the most seriously endangered animals. After the Bali Tiger, the Javan was the smallest subspecies: it is now one of the rarest of all cats. At the opposite end of the spectrum is the Siberian or Amur Tiger, which is the largest of all cats; some exceptional animals have been measured at 335 cm in length and 318 kilos in weight. Due to human predation, there are few left. Stephen, son of the Duke of Geza, Ruler of the Magyars, was born AD 975 in Pannonia, which was situated between Hungary and Yugoslavia. Stephen wanted more than simply to inherit his father’s title. When the duke died, Stephen made a special request to Pope Sylvester II, asking to be made king of Hungary. The Pope was agreeable to this request, especially as Stephen was married to Gisela, the daughter of The Holy Roman Emperor. 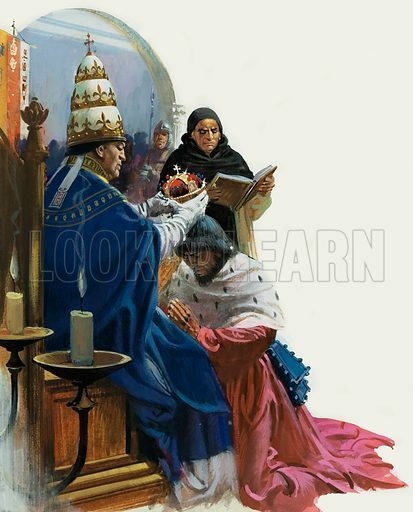 Stephen’s wish therefore was granted, and he received not only the title of “Apostolic Majesty” from the Pope, but also the gift of a unique crown. The king of Hungary was crowned with great solemnity in AD 1000. Stephen was a much respected monarch and was canonised in 1083. His crown has become a national symbol of Hungary, though the country has long since ceased to be a monarchy. The crown is made in two tiers, each decorated with hand-enamelled panels. In the first tier the panels show Christ as Ruler of the Christian World, the Byzantine Ruler, Emperor Michael VIII and the Emperor Constantine Porphyrogeneto. There are now more wild deer in Britain than at any time since the Middle Ages. Yet, despite their size, deer are remarkably good at keeping out of sight, and many people live close to deer but are unaware of their existence. 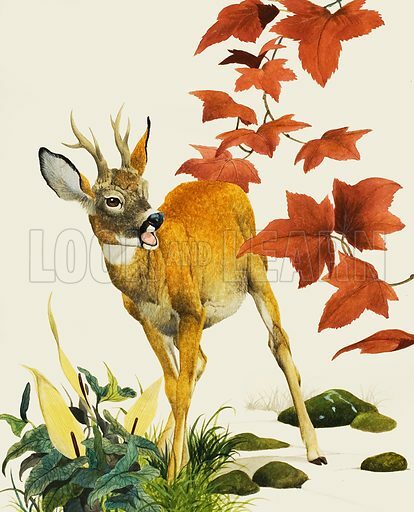 To the practised eye, the signs deer leave behind them are easy to see: the well-marked paths, with the familiar cloven-hoofed footprints (known as slots); the deer jumps, where the animals regularly jump fences, leaving behind perhaps a tuft of hair on barbed wire; even shed antlers can betray their presence. To see the deer themselves can take greater skill, for after centuries of persecution most of our deer are nocturnal, leaving the sanctuary of their home wood to come out and feed at night. 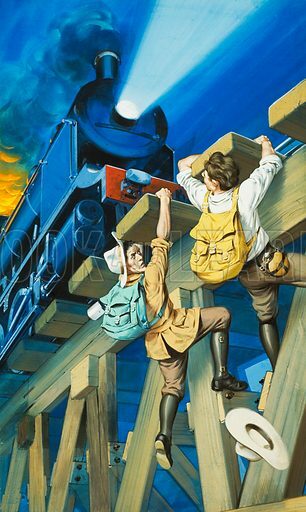 It was pitch dark as the two men made their way along the narrow railway bridge across a ravine. Suddenly, a distant sound broke the silence. By the time they had reached the middle of the bridge they realised to their horror that a train was coming towards them at full speed. Desperately, the walkers swung themselves down into the night, holding on to the protruding sleepers. A nightmare of noise and hot ashes tore around them as the train thundered over, shaking the bridge as it passed. Fred Walker, a Scotsman from Glasgow, almost fainted, and had to be hauled back up by his companion, an American named Tarver. This was not the first of Fred Walker’s hair-raising adventures — nor was it to be the last. His travels had begun in 1905, when he was 17. Fred’s only ambition was to see as much of the world as he could, and do as many different things as possible. He started off in the United States and Canada, earning his living as a cowboy and building dams, survived the great San Francisco earthquake of 1906 and then headed down to Mexico to work on a ranch. Almost 480 kilometres above the Earth’s surface the spacecraft Voskhod 2, launched from Kazakhstan and commanded by Colonel Pavel Belyaev, hurtled through space at a speed of approximately 29,000 km/h. Belyaev’s only companion was 30-year-old Lieutenant-Colonel Alexei Leonov — the man who was poised to add another distinguished chapter to space history. 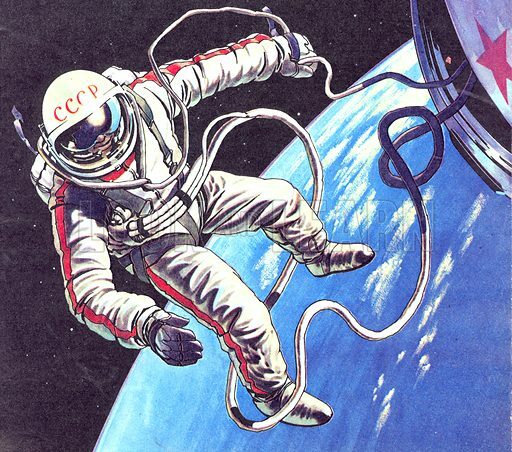 Born in Altai, Siberia, the Soviet cosmonaut had been selected to become the first man actually to leave a spacecraft and “walk” alone in outer space. It was on 28 May 1848 that the trading ship Mischief cast anchor at the gateway to the Amazon, the city of Para. Aboard were two young Englishmen, Henry Walter Bates and Alfred Russel Wallace. 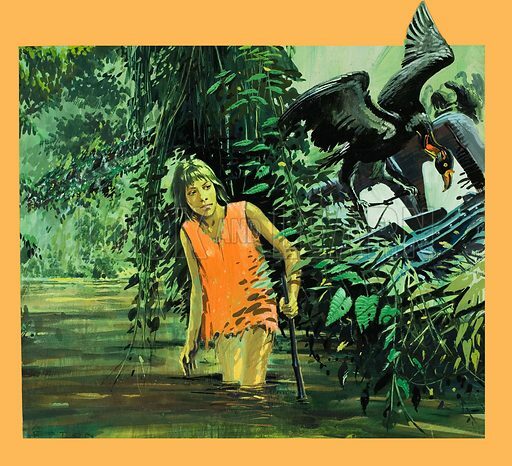 Their object in coming to South America was to make a survey of the insect and bird life and smaller animals of the virtually untouched tropical Amazon valley — and to find facts to help solve the question of the origin of species. Their youthful enthusiasm was not quenched by the dense, moist air. Early in the mornings they went out to capture gorgeous toucans, colourful humming-birds and parrots. The insects had their turn in the heat of the day. 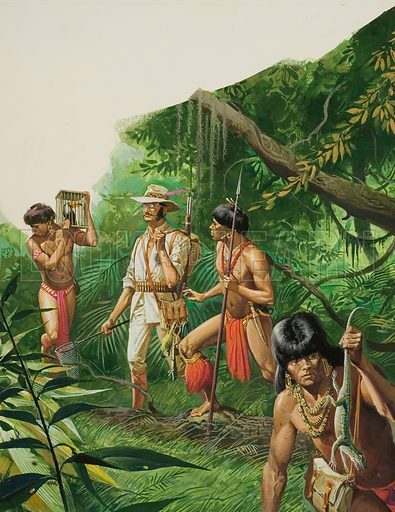 Loaded with their exotic catches, the two men trudged home while their neighbours relaxed in their hammocks. After dinner they sat down to mount the insects, skin the birds and make notes. So dedicated were they that ant stings on their legs made them curious rather than annoyed. Bates is credited with publishing the first description of the leaf-cutter ant. Flight 508 left Lima, the capital of Peru, on Christmas Eve, 1971. Its destination was Pucallpa, in the heart of the Peruvian jungle. Ground control received a routine message half an hour after takeoff that the plane would land in 38 minutes’ time. That was the pilot’s last communication with ground control, for radio contact was suddenly lost. Christmas, 1971, is a time which Juliane Koepcke, one of the passengers on board flight 508, will never forget. On that fatal Christmas Eve she woke up to find herself lying beside four of her fellow passengers. They, like the rest of the passengers on board the plane, had been killed. The advertisement was one which few boys could resist: “Wanted. A Boy Scout to join the crew of an Antarctic expedition led by Sir Ernest Shackleton.” There were so many replies that Sir Ernest decided to pick two boys. On 17 September 1921, to the cheering of a huge crowd which had gathered along the Thames, Shackleton’s ship, the Quest, sailed from London. When the voyage began, Shackleton was his usual cheery self. But from the outset, a series of mishaps combined to add to the burden of responsibility he carried. On the first leg of her journey to Rio de Janeiro, the Quest had serious engine trouble and extensive repairs had to be undertaken when she reached port. Then, on the night before sailing from Rio, came the first warning sign that all was not well with the expedition’s leader. While he was dining ashore, he complained of feeling faint. 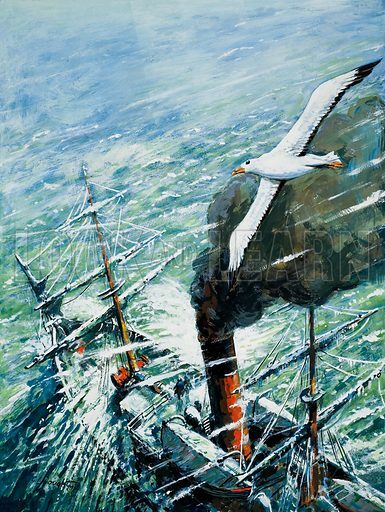 The ship’s doctor was concerned, for he knew that Shackleton had been taxing his strength, but the incident was soon forgotten. Some people set out deliberately in search of adventure. Others stumble on it through sheer chance, ordinary people whose thoughts normally turn on the next meal or the prospect of a rest after a hard day’s work. Such men were Elias Stadiatis and Demetrios Kondos. Shortly before Easter, 1900, two sponge-fishing boats from the Greek island of Syme were on their way through the Aegean Sea when they were hit by a storm. The leader of the expedition was Captain Demetrios Kondos, and he made for shelter off the little island of Antikythera. After the storm had subsided, the sailor decided to try his luck looking for sponges by the island. 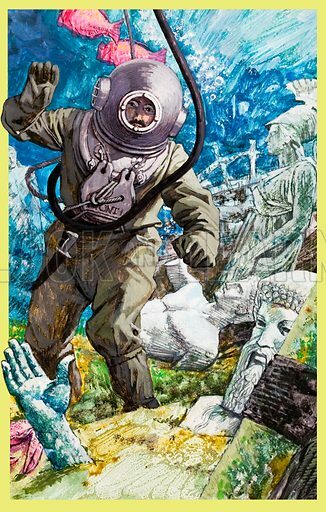 The first man into his diving suit was Elias Stadiatis: he was lowered over the side — and into the biggest adventure of his life. The diver’s feet touched bottom, and, as the waters cleared around him, Elias found himself surrounded by strange shapes. Men lay sprawled on the floor of the sea; women sunk up to the waist in sand stared up at him. Silent and tense, Donald Campbell was oblivious to the dazzling glare of the sun as he watched his father climb into the cockpit of the gleaming racing car, Bluebird. He had faith in his father’s ability. His confidence was well-founded. The name of Sir Malcolm Campbell was not one that was associated with defeat. Calm though he was, Sir Malcolm could not help remembering the deaths of some of the other drivers against whom he had competed in the past. Parry Thomas, Sir Henry Segrave, and Ray Keech had all been killed by their craving for speed. But, on this day, 3 September 1935, he knew he must set aside such thoughts, for he was now setting out to establish a new world land speed record, and to be the first to achieve 300 mph. It was the culminating point of a racing career that had started simply enough when, as a 21-year-old stockbroker, he had become a keen motor-cyclist and won his first race in the same year. That had been in 1906.